ONLINE IS NOW CLOSED, BUT YOU CAN STILL REGISTER AT PACKET PICKUP AT THE VENUE ON FRIDAY FROM 4:30 TO 7:00PM OR EVENT MORNING. The Denver Broncos are traveling north as a part of their Broncos Fit initiative and will continue their 2017 Broncos 7K Series in Fort Collins on June 3, 2017. Participants will start the run/walk at The Budweiser Brewery Experience and make their way around the grounds of the iconic Anheuser-Busch brewery. In addition to the scenic views and Broncos themed elements, attendees will be able to participate in the post-run city celebration featuring: current Broncos players, cheerleaders, Miles the Mascot, all three Broncos Super Bowl trophies, giveaways and family-fun activities! 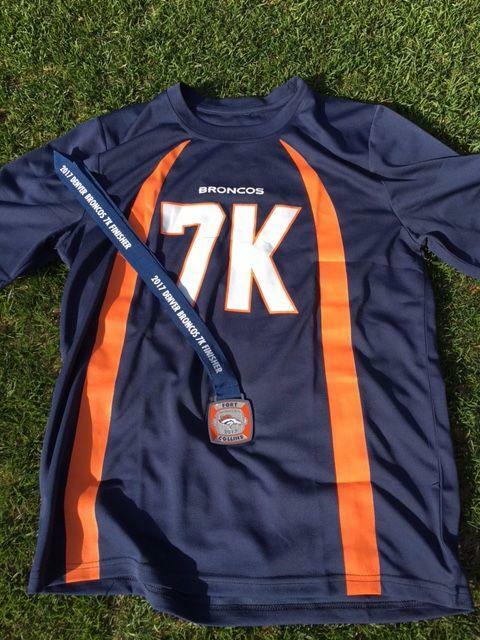 Plus, all run participants will receive a unique Broncos 7K Fort Collins T-shirt and finisher’s medal! If you are a part of Broncos Country and are looking to combine your active lifestyle with your favorite NFL team, join us at the Broncos 7K Fort Collins! Chance to win prizes like game tickets, autographed merchandise and more! Prizes like game tickets, autographed merchandise and more!